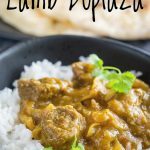 This delicious Authentic Lamb Dopiaza, is easy to make at home. 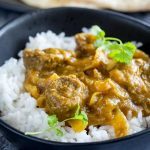 With plenty of onions, easy to find spices and a naturally gluten-free sauce, this Traditional Dopiaza recipe is a simple authentic lamb curry you can make at home. Serve it with plain rice or some naan breads, for a delicious meal for the whole family. The lamb curry is finished is traditionally finished with yogurt, but coconut cream makes a great creamy alternative. In Hindi “do” means “two” and “piaza” translates to onions – So the name Dopiaza means two lots of onions. As you would guess that means that this lamb dopiaza curry uses a lot of onion. In fact, onions are used in two ways in this curry. But they are cooked long and slow giving them a wonderful sweetness. 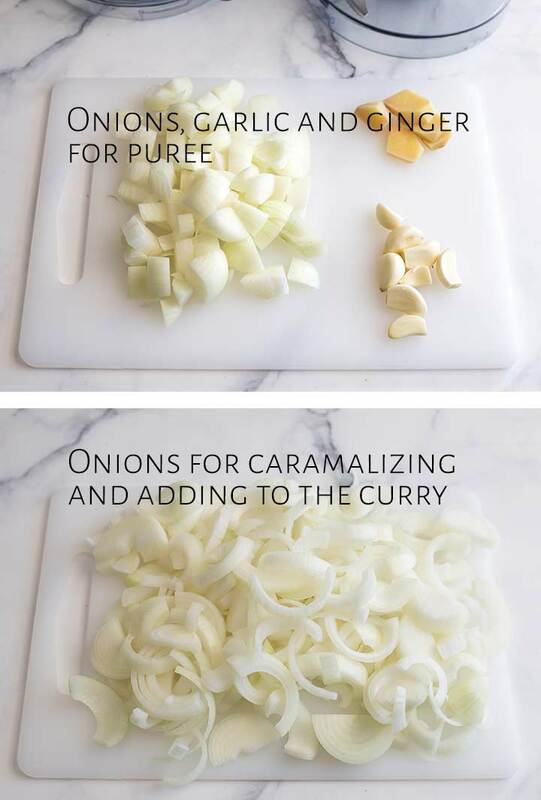 The base for the curry is made with pureed onions, this adds flavor and sweetness, but it also naturally thickens the sauce, making it perfect for those on a low carb or gluten-free diet. Then thick-cut caramelized onions are added to the sauce to give it bulk and sweetness. As mentioned above Dopiaza has a LOT of onions in it. The recipe says to cut some into rough chunks as these will be pureed with the garlic and ginger to make a paste. You can see from the picture below that you want the puree to be quite smooth. This is what thickens the sauce. The rest of the onions are cut into thick moon shapes and fried off until lightly caramelized. These are added to the sauce towards the end of cooking. They are more visible as onions in the finished dish. You can either do this before you start the curry and store them in the fridge or do it whilst the curry is cooking. First cook the moon shaped onions in ghee or oil, until lightly caramelized. Remove these from the pan and set to one side. These basic spices along with the sweet onions create a wonderfully deep rich sauce. Stock and tomato paste are added and the curry is simmered for an hour until the meat is tender and the sauce is rich and flavorful. Because this curry is cooked low and slow you can buy a cheaper cut of lamb like lamb shoulder. A boneless shoulder is easier as you can just cut it up without having to worry about the bone. Have a look at the grocery store or ask your butcher. The shoulder meat will be so tender once it has cooked for an hour in the flavor base. 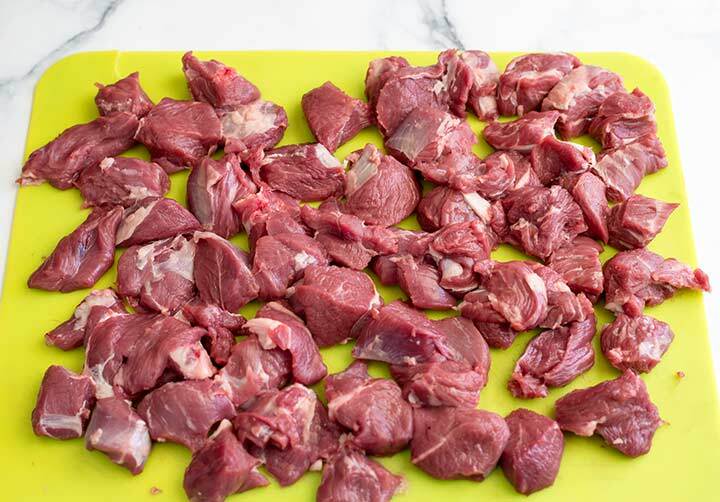 You want to cut the meat into large bite sized chunks as they will shrink slightly during cooking. Don’t cut your meat too small or it will start to disintegrate into the sauce. 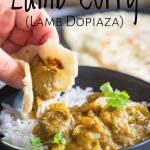 How Spicy is Lamb Dopiaza? Dopiaza is a reasonably mild curry, making it great for kids or those who don’t like spicy foods. You can add heat with some cayenne pepper or serve it with fresh chopped green chilies for people to sprinkle over as they like. How Saucy is Lamb Dopiaza? 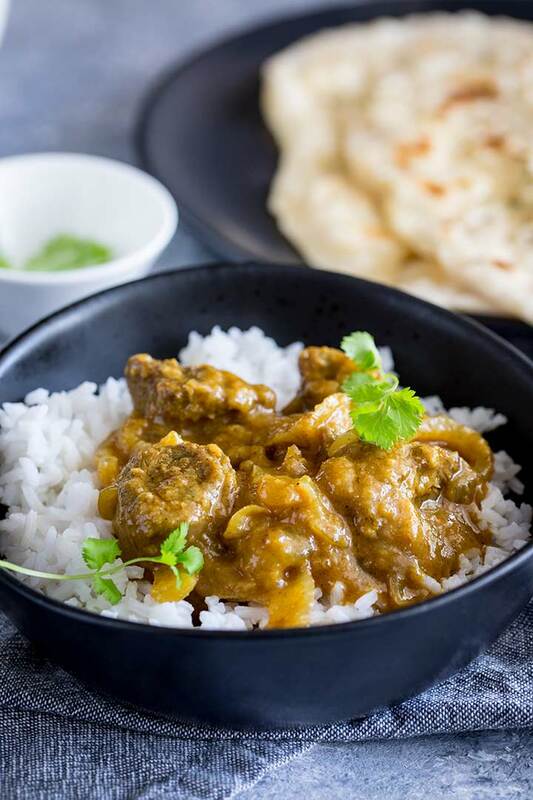 Dopiaza is a saucy curry, the onion puree, spices and vegetable stock make for a richly flavored sauce that coats the meat and soaks the rice. It is great for serving with Naan bread, as there is plenty of the thick sauce to scoop up with the bread. It has a sound more like Plaza rather than Pizza. If you like a less tangy curry then I suggest using coconut cream in place of the yogurt, it isn’t authentic but it does taste great! The kids love that too! Can you make this Lamb Dopiaza ahead of time? YES!! In fact, like most curries, Dopiaza is even better if made in advance. It gives the flavors time to develop, marry and meld together. To make ahead, follow the recipe below until the curry is cooked fully, (Stage 11 on the instruction card) then remove it from the heat. Don’t add any yogurt/coconut cream and allow it to cool. Once cooled it will keep in the fridge for 3 days. Or the freezer for 3 months. To serve, bring it room temperature then reheat over a medium-low flame until bubbling. Add in the yogurt/coconut cream and garam masala, bring back to a simmer and serve. Don’t forget to serve this curry with plenty of rice and a side of EASY Homemade Naan Bread. Pin this recipe for Authentic Indian Lamb Dopiaza Curry. Pin it here. This delicious Authentic Lamb Dopiaza, is easy to make at home. 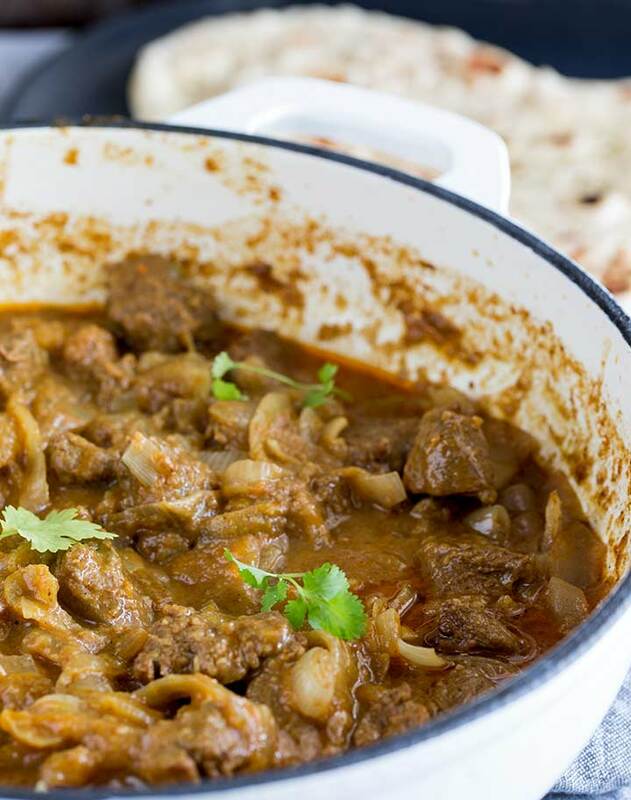 With plenty of onions, easy to find spices and a naturally gluten-free sauce, this Traditional Dopiaza recipe is a simple authentic lamb curry you can make at home. Serve it with plain rice or some naan breads, for a delicious meal for the whole family. 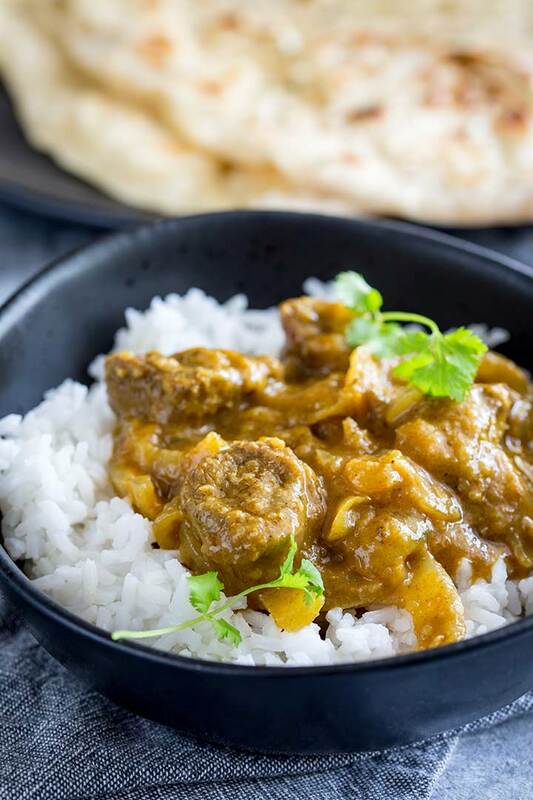 The lamb curry is finished is traditionally finished with yogurt, but coconut cream makes a great creamy alternative. Roughly chop 4 of the onions. 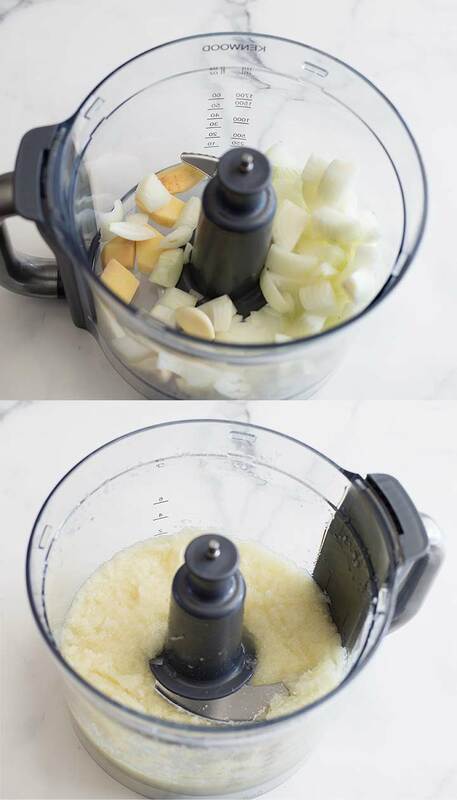 In a food processor or blender add the 3 onions, garlic cloves and ginger with 1/4 cup of hot water. Blend until you have a thick paste. Set to one side. Cut the remaining 6 onions into half moon slices. Melt the ghee/oil in a large heavy bottomed pan and fry the onion moons. Use a medium-high heat. You want the onions to cook quickly and start to caramelize. Using a slotted spoon to remove the onions from the pan and set aside for later. Cut the lamb into bite size chunks and fry it all off in the onion flavoured ghee/oil. Add your onion-garlic-ginger puree to the lamb pan, give it a nice stir to coat the lamb. Cook over a low heat for 10 minutes, until the onion mixture has softened. Don’t allow the mixture to color. 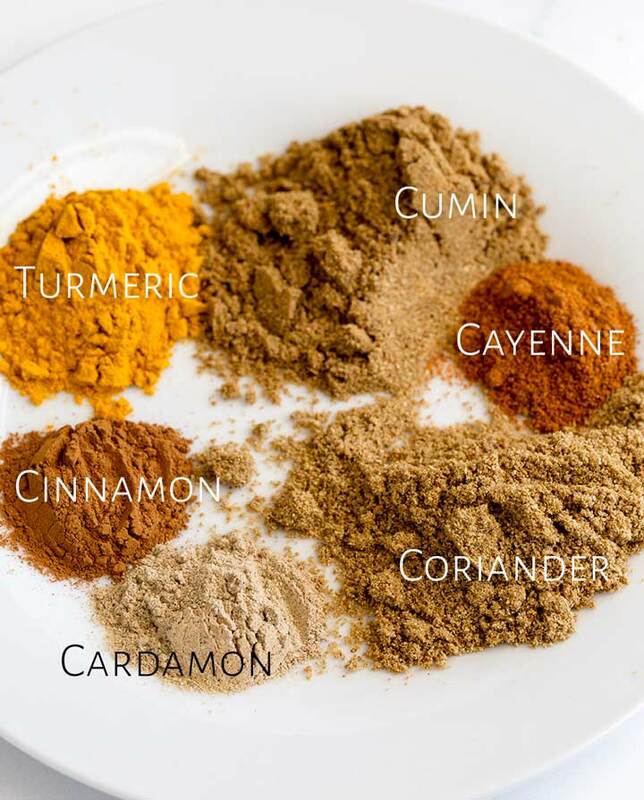 Stir in the ground cumin, ground coriander, ground turmeric, ground cinnamon, ground cardamom, cayenne pepper (if using) and stir together. Pour in the stock and tomato paste, stir well and gently simmer, uncovered, for an hour. Check the lamb is tender. If not give it 10-15 minutes more. If the sauce is looking too dry add an extra 1/4 cup of water. Stir through your fried onion moons, the yoghurt/ coconut cream and garam masala. Then cook for a further 5 minutes. Finish the curry with a squeeze of lemon juice and fresh cilantro. Serve with Easy Homemade Naan bread. This Lamb Dopiaza is cooked low and slow so you can buy a cheaper cut of lamb like lamb shoulder. A boneless shoulder is easier as you can just cut it up without having to worry about the bone. Have a look at the grocery store or ask your butcher what they suggest. Make sure you tell him that it will be cooked in liquid for at least an hour. 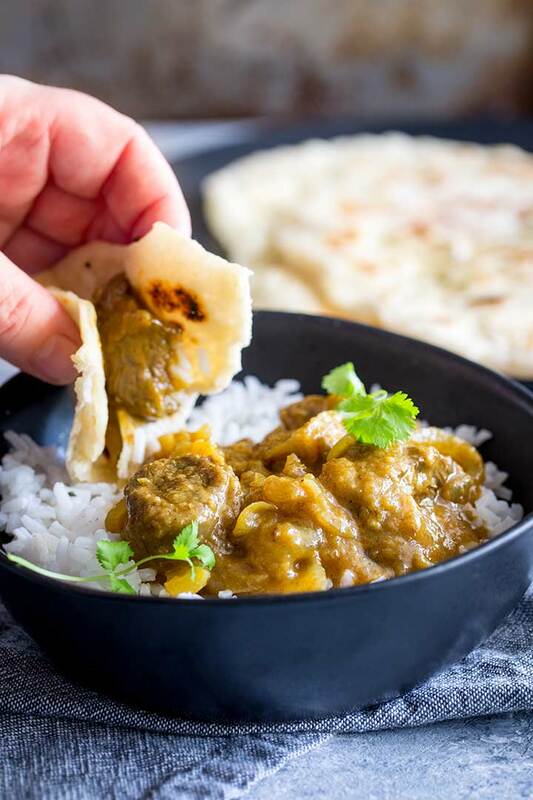 If you love food why not subscribe to my newsletter, I will drop you an email every now and then, just to say hi and send you a couple of recipes I think you might love, like this Authentic Indian Lamb Dopiaza Curry. I’d be dipping away for sure into that rich sauce! I love onions as well, and don’t think there are ever too many onions, so this is definitely going on my list to try. It sounds absolutely amazing!